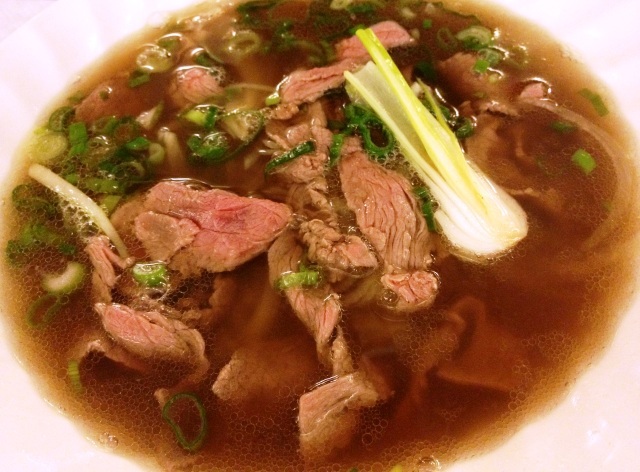 Through our friend, we had heard much about this Vietnamese restaurant located just outside Central London, near Canada Water tube station. Considering the rather inaccessible location of the restaurant, I was rather surprised when she mentioned that we should head there early to avoid the queue, but thankfully there was none to speak of when we arrived and was sent straight to our table. 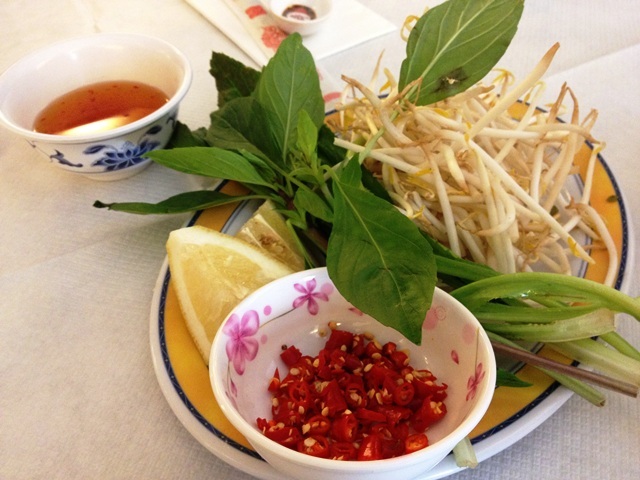 The place was full though when we arrived and shortly after placing our orders, they served us this plate of beansprouts, Thai basil and Vietnamese mint, lemon and a saucer containing bird's eye chillis! (my personal favourite) These amongst the likes of lemongrass and long coriander are but popular ingredients for Vietnamese cuisine. 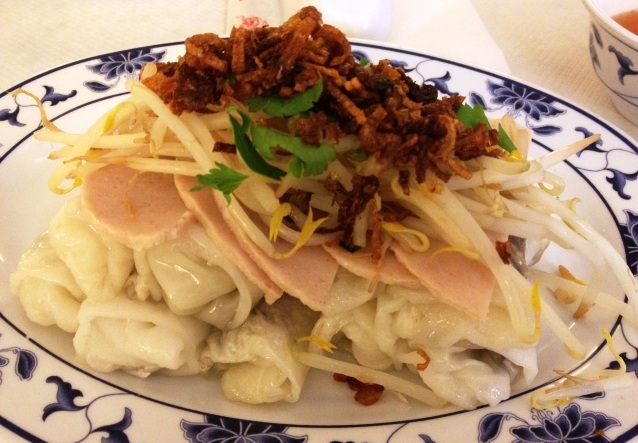 Traditional Vietnamese cooking is mostly admired for their usage of fresh ingredients, minimal use of oil and reliance on herbs and vegetables, reputably one of the healthiest cuisines in the world. It was worth noting however that the Thai basil leaves being served was not the freshest crop if you noticed from the picture above. The bean sprouts and lemon were a tad too dry, i.e. which meant they were not the freshest produce. This put me off quite a bit considering that my high expectations for this restaurant. This is a famous Vietnamese steamed pastry (Cheung Fun; like the ones served at Chinese restaurants for dim sum) filled with savoury Chinese mushroom and minced pork. 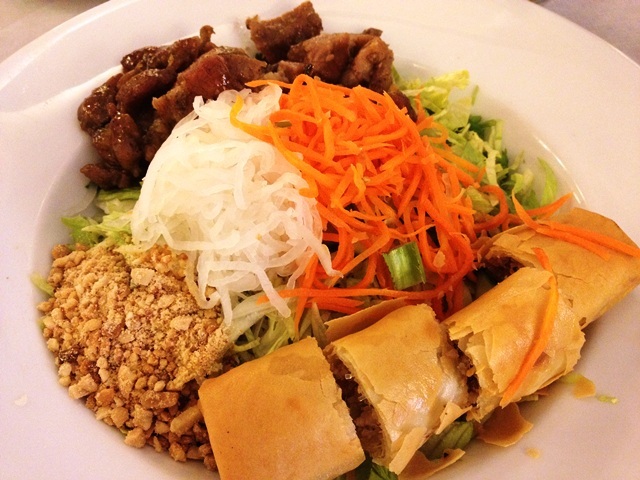 It was topped with sliced meat loaf, fried shallots and poached beansprouts. 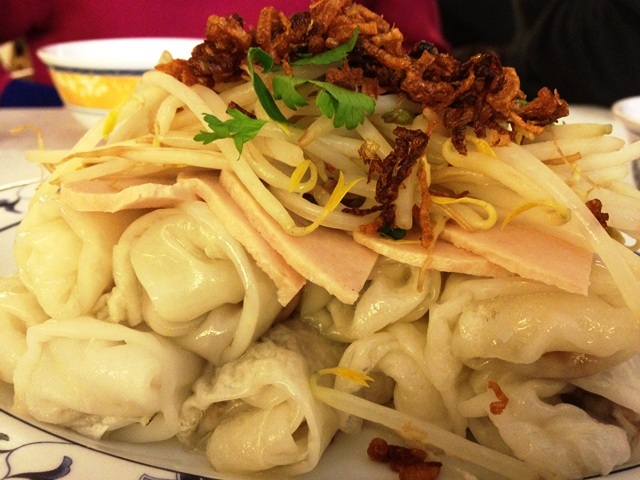 The texture of the steamed pastry (cheung fun) was soft, tender and not overly sticky, which was good. It was not overly greasy too, which suited our palette. There was a special Cafe East fish sauce, identical to the bowl of sauce in the 1st photo above, which was mildly sweet and fragrant and went surprisingly well with this starter. 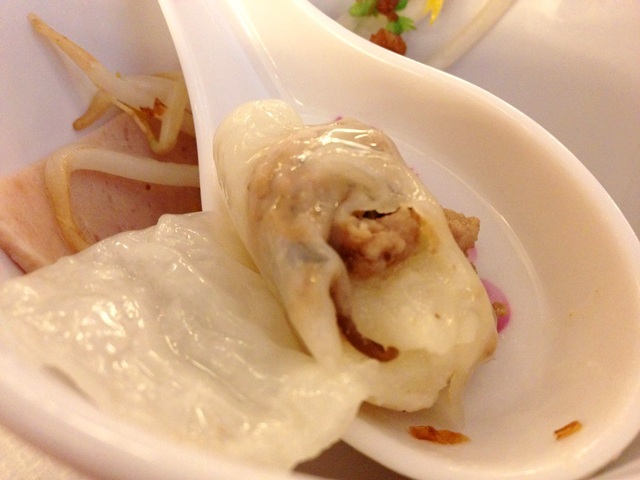 The minced pork was well marinated and tasted very flavoursome, which complemented the plain-tasting steamed pastry. A good start to our meal already! Right, you must be thinking what does that name mean? 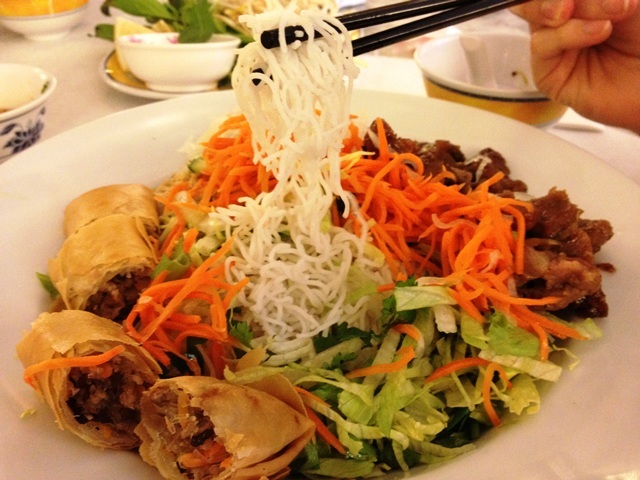 Beats me to be honest, but in a nutshell, it was warm vermicelli rice noodles topped with herb salad, pickled molly carrots, peanuts, a crispy fried spring roll and lemon-grass pork and like the starter, it was served with their speciality Cafe East fish sauce. It was an interesting dish and certainly very pleasing to the eyes to say the least. There was an abundance of texture to go around the plate, from the soft bouncy vermicelli to the crisp crushed peanuts, which I must say complemented each other perfectly. When drizzled with the fish sauce, it helped to 'loosen up' the mixture of salad and vermicelli, giving that much needed 'moisture' in the dish to prevent it from tasting too 'dry'. (well, think of salad without any dressing and you should get what I am driving at) The fried spring roll won me over with a crispy skin that was brittle and was packed rich with ingredients as seen above. 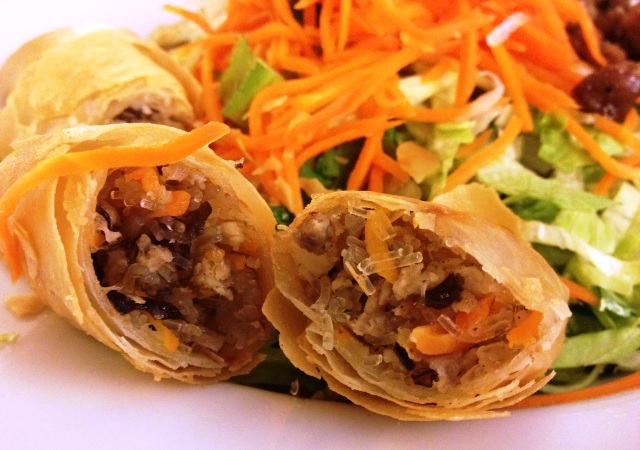 The Chinese mushroom (or commonly known as Shitake mushroom) was finely diced and packed into the spring roll, which gave it that extra touch of natural fragrance. 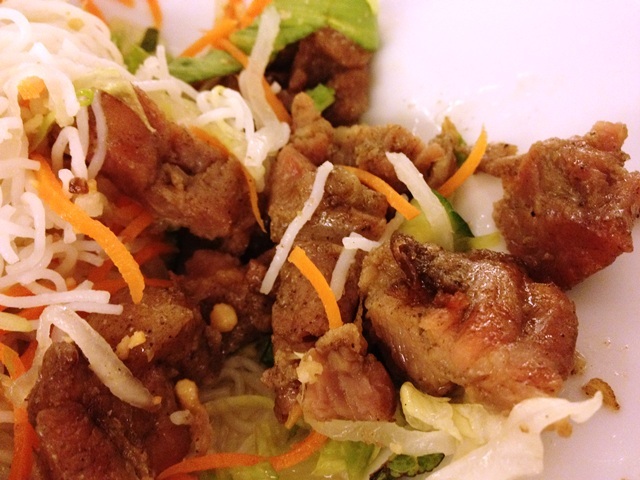 The lemon-grass pork was certainly on the savoury side and was very tasty and rich in flavour. The downside to it though was that it was over-cooked, resulted in rather stiff and dry pieces of meat. Now 'Pho' sounded like something more familiar to me at least as opposed to the names of the above dishes. This was basically free range chicken with flat rice noodles (pho being the flat rice noodles) and I opted for the chicken stock soup base. 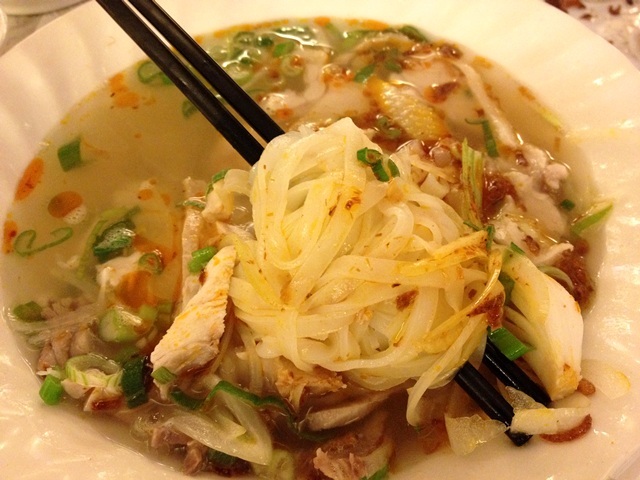 One had the option to choose from spicy, mildly spicy or non-spicy soup base for all noodle soup dishes. Being a huge fan of spicy dishes, I went for the spicy soup base. 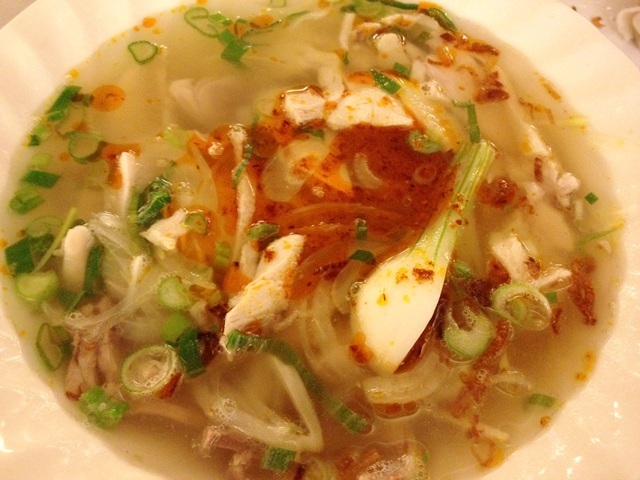 You could see a thin layer of chilli oil on the soup base. I almost cringed at the mention of 'chicken stock' on the very first instance when given the option to choose between that and the beef stock, for the infamous 'OXO' chicken stock cubes came to mind. Thankfully, this was nowhere close to that and it tasted very fresh, fragrant and natural, a well-brewed chicken stock that had seen hours of work in the pot. With the Thai basil, beansprouts and mint being added to the dish, it instantly gave a very refreshing burst. The chicken pieces came with skin attached, which certainly contributed to the flavour of the soup, but might be a 'no-no' for the health conscious. Like the lemon-grass pork, the chicken pieces tasted a tad too stiff but was compensated by the soup. Even though the soup base was supposed to be spicy, it was somewhat not strong enough to give me that 'oomph', so out of exasperation, I emptied the entire saucer worth of bird's eye chillis and finally got that much wanted 'kick' from the fiery hot chillis. This was supposedly the recommended dish by our friend, but I was not too inclined on having beef. Anyhow, this was rare beef with flat rice noodles, which had the option of being served in either spicy or non-spicy soup base. I am writing this with reference to my lady's critique of her sampling of the dish. The beef was supposed to be served 'rare', but as one might see from the picture above, it came across more as medium-cooked. We attempted to photograph it as soon as it was brought to our table, but this was pretty much the state of it. The beef stock was fragrant and went well with the dish as a whole. Our friend is a huge fan of this dish apparently, but I would reserve my most genuine opinion till next time when I actually get to taste it. VAT had already been included into the price and there was no service charge being levied upon the bill. Do note that while drinks are not mandatory to order, tap water would not be served. There was not much ambience to speak of on the inside of the restaurant, with a simple setting, which reminded me much of Wagamama, though if the Sun comes out more over the remaining days of summer, it might be an enjoyable dining experience yet on the outside of the restaurant on the wooden tables and benches. You might notice that the tables are not exactly too far apart from each other, so it might not be your perfect dating spot, but it is definitely reasonably priced for the quality of food. When we had just about finished our dinner, the waiter came around to our table and remarked 'Finished?'. It did not come across as the most polite gesture and made us felt as if they were rushing for our departure. While we appreciated that it was the peak dinner period, a friendlier attitude would certainly have been more preferable. It was on the whole an 'okay' dining experience, and for such prices in Central London, it was no wonder they are packed on most nights.